Yesterday, June 21 2009, I had to give a presentation on payment gateway integration at our office. That’s why I prepared a slide show. I mainly tried to show how PayPal’s Direct Payment API calls are made. I have choosen this because this technique is also used by other payment gateways. 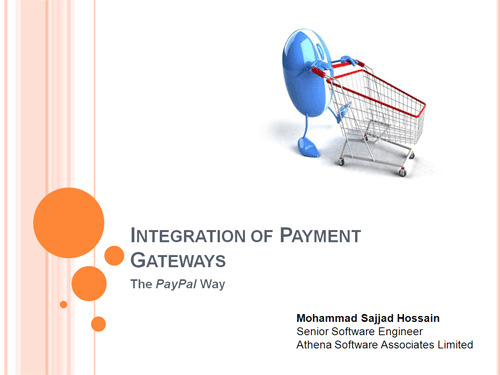 As I have shown the example based on PayPal, I called this session – “Integration of Payment Gateways, The PayPal Way“. It gives a basic idea how we can make API calls for payment processing. I have quoted some texts and images from PayPal’s integration documents. You can download the presentation from here. For PDF version, click here.